I have been working with the schoolchildren from a local Bristol school, Fishponds Church of England Academy, for the past couple of years as part of my work with Historic England’s ‘Heritage Schools’ scheme. This has involved taking them on First World War themed heritage walks around the local area, including visits to the nearby local war memorial and the Glenside Campus of University of West of England (UWE), the former mental asylum which, in its wartime guise at Beaufort War Hospital, had over 30,000 wounded service personnel pass through its gates. 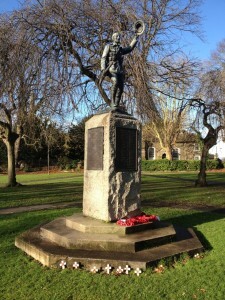 During this period it was discovered that the striking Fishponds War Memorial was not ‘listed’ by Historic England. The idea was formed to engage the local schoolchildren to work on getting their memorial listed. If successful, it would be the first time schoolchildren would play such an active role in this process. Furthermore, it would be a wonderful way for local children to engage in their community. The project began with high hopes as Historic England has pledged to protect 2,500 war memorials by 2018 to mark the centenary of the First World War. 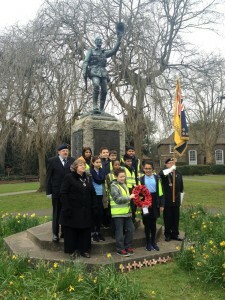 In November 2015 I accompanied Michael Gorely, who manages the ‘Heritage Schools’ programme for Historic England, and a number of Year 6 children to the war memorial. The task was to carry out a condition survey; recording factual details such as the memorial’s physical appearance, what materials it was made from, its shape, size, setting and any changes from its original design. Also noted were details of plaques and additional inscriptions. 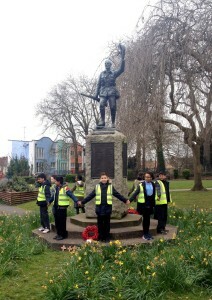 The children also researched its history and wrote persuasive letters asking the memorial be listed to the Designation Department at Historic England. It was the department’s decision whether to grant listed status with the final ratification made by the Department of Culture, Media and Sport. A selection of comments from the children’s letters can be found below. The original memorial had been designed with a bayonet on the end of the soldier’s rifle but had been repeatedly vandalised. As a consequence the bayonet was eventually removed. The children and staff at the school are now working on getting a replacement bayonet added. Ironically, this is much harder now due to the memorial’s listed status! A small number of Fishponds Church of England Academy children will be visiting the Houses of Parliament next week to speak to an All-Party Group about their success. Everyone who has been involved with this scheme has played a part in ensuring that pupils can learn about, connect with and enjoy their local heritage. So, let’s hope it continues and more children reap the benefits. And a huge congratulations from me to all of the children involved.